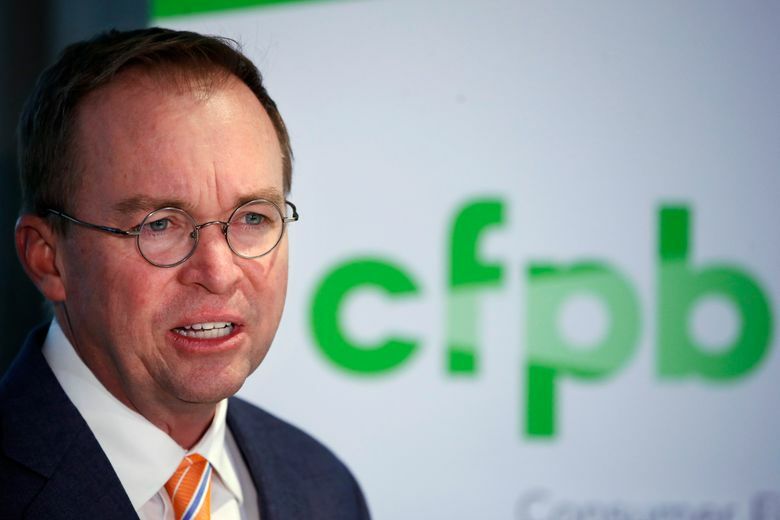 Acting director Mick Mulvaney is launching a top-to-bottom review of the Consumer Financial Protection Bureau, which will let financial firms suggest changes. That's “essentially like asking the fox in what order it would like to eat the hens,” said one consumer-watchdog expert. On Wednesday, Mulvaney announced he was launching a review of the entire operation of the consumer-watchdog agency created after the 2008 financial crisis. CFPB reconsidering repeal of rule that would have protected consumers against harmful payday lenders. The bureau has provided Americans with billions of dollars in refunds and debt relief, often at banks’ expense. Republicans and many financial firms have complained that it has been too aggressive. “In this New Year, and under new leadership, it is natural for the bureau to critically examine its policies and practices to ensure they align with the bureau’s statutory mandate,” said Mulvaney, a former Republican congressman who was appointed acting director by President Donald Trump in November. It will seek comment on its enforcement of consumer-protection laws, drafting of regulations, oversight of financial firms, monitoring of the marketplace and public education. “Much can be done to facilitate greater consumer choice and efficient markets, while vigorously enforcing consumer-financial law in a way that guarantees due process,” said Mulvaney, who also serves as the White House budget director. The announcement came the day after the bureau said it would consider revising or repealing regulations that were designed to protect consumers against harmful payday lenders. Most of those rules were scheduled to take effect next year. Mulvaney’s review of bureau operations, which will let financial firms suggest changes, “is essentially like asking the fox in what order it would like to eat the hens,” said Karl Frisch, executive director of Allied Progress, a consumer-watchdog group. “It is a troubling move from a man who is clearly hellbent on dismantling the agency he has been tasked with overseeing when he should be fulfilling its mission to protect consumers and hold bad financial actors accountable,” Frisch said. The bureau was created by the Dodd-Frank Wall Street Reform and Consumer Protection Act. It has provided consumers about $12 billion in refunds and debt relief from financial institutions since opening in 2011.